Domain name is in escrow at Escrow.com. 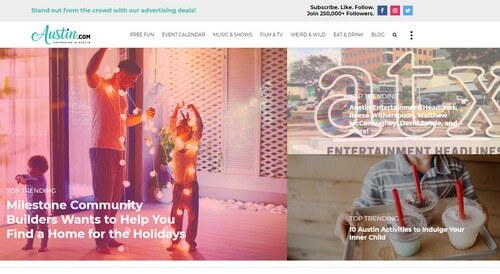 Austin.com is in escrow at Escrow.com. iEstates, LLC purchased the domain name in 2012 but put it up for sale earlier this year. An October 4 DomainTools Whois record shows the domain was in escrow at Escrow.com. The domain was transferred from Moniker to GoDaddy at that time. The Whois record still shows Escrow.com, suggesting that the domain name is on a payment plan or other sort of arrangement that will require Escrow.com to hold the domain in escrow. I searched the site for clues about who might now own the site but the terms of service and management information haven’t changed since before October. New content continues to be published. The buyer seems to be CafeMedia.